Product prices and availability are accurate as of 2019-04-23 13:31:34 UTC and are subject to change. Any price and availability information displayed on http://www.amazon.com/ at the time of purchase will apply to the purchase of this product. 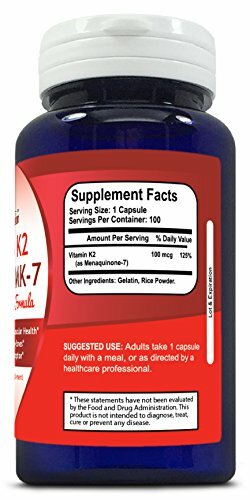 Contains 100 mcg of Vitamin K2 as Menaquinone-7 per capsule. Highly absorbable for maximum bioavailability. Contains NO chemicals, preservatives, artificial color or flavor, magnesium stearate, dioxides, sugar, salt, starch, yeast, wheat, gluten, corn, or milk. 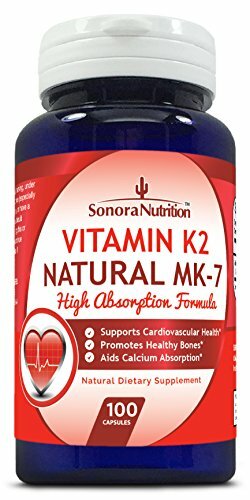 Order your bottle of Vitamin K2 today to start feeling your best! 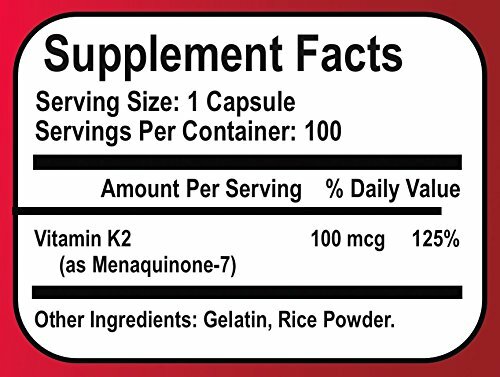 POTENT & EFFECTIVE: 100 mcg of Vitamin K2 as Menaquinone-7 per capsule. Highly absorbable for maximum bioavailability. SUPPORTS CARDIOVASCULAR HEALTH: Vitamin K2 plays a critical role in maintaining cardiovascular health as well as aiding calcium absorption and supporting healthy bones. * HIGHEST QUALITY: Contains NO chemicals, preservatives, artificial color or flavor, magnesium stearate, dioxides, sugar, salt, starch, yeast, wheat, gluten, corn, or milk. MADE IN THE USA: Manufactured in an FDA approved, GMP compliant facility. 100% HASSLE-FREE GUARANTEE: If you aren't satisfied for any reason, just contact us and we'll give you a full refund, no questions asked, and no need to return the bottle.